first of all, great work indeed with Affinity Photo! I downloaded the trial version yesterday and almost instantly fell in love with it. I was wondering if from the Fujifilm raw files there's any features available to apply the well known/beloved Fujifilm film simulations. That would really make the difference for me and for us fuji lovers. 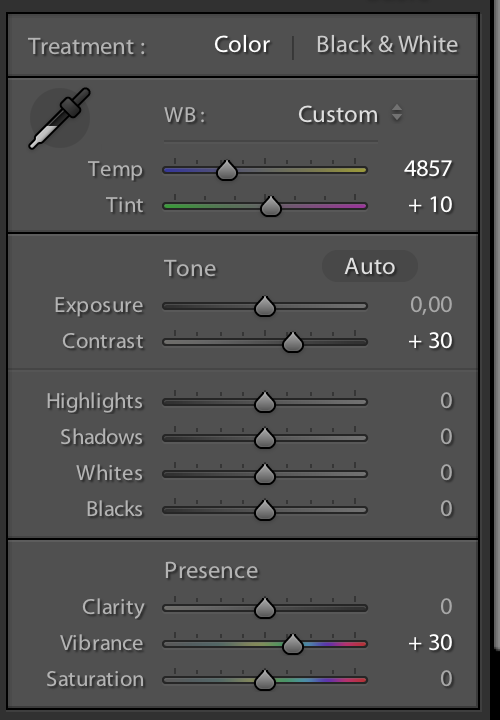 I can do this in Adobe Lightroom "camera profile" panel, as shown in the image I'm attaching. Is there any way to to this with Affinity as well? And if not, is it this feature planned for any future update? Thanks for your help and keep on the great work! If you can adjust your picture 'manually' to mimic Fuji film, you can save it as a LUT and apply to other pictures. I wish it was that simple, but it's really hard indeed to manually simulate the excellent fuji film simulations. I had a look in Lightroom. I added a fuji film preset and opened the panels. Here's some screenshots of the settings. 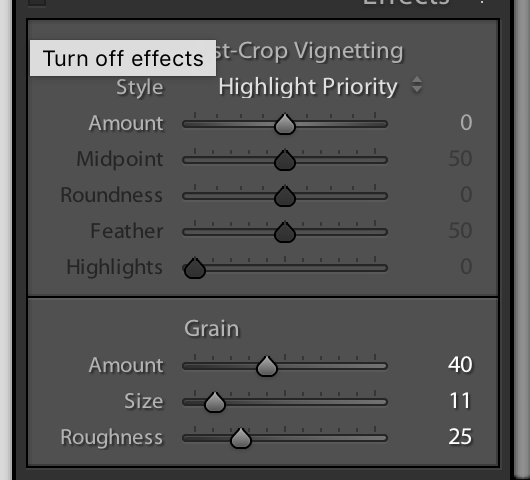 To simply copy Lightroom or Adobe Camera Raw settings won't give the look of any given camera profile. Algorithms are ideed different between all applications, not to mention custom curves and some secret sauce under the hood. So, no there is no chance, as far as I know, to replicate Fuji's color profiles. But LUTs would be my best guess too. Of course, I didn't mean that you could copy the settings. But it can give you a clue on where to begin. 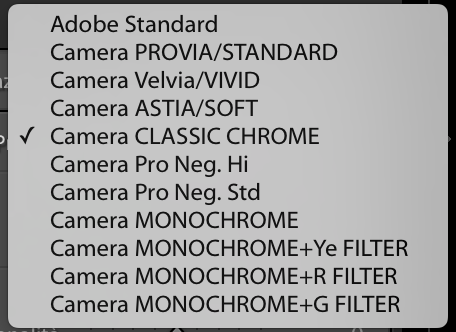 Is there a way to share these LUTs once one of us gets a Provia, Velvia, etc. simulation that we like? yes, exporting a 3dlut produces a file that can be copied, moved, shared over the net just like any regular file. the limit with luts is that they are not tweakable (as far as i know), so they are mostly useful when you want to export a set of adjustments to a program that cannot read .afphoto files. 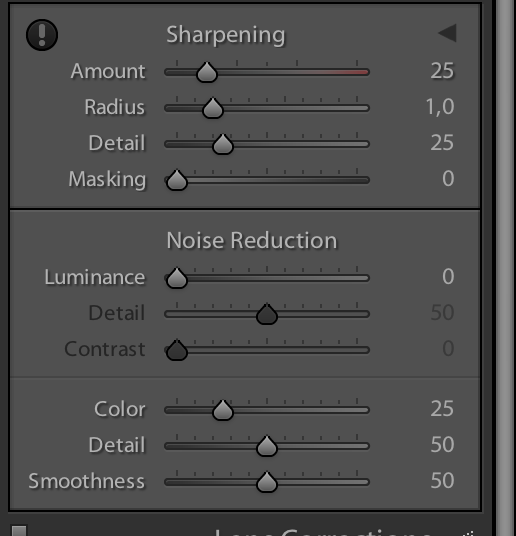 however, if the goal is to share such adjustments among affinity photo users, imho it could be better to save only the adjustment layers as .afphoto files (after deleting any image and -probably- mask) and share these ones: anyone who uses them can tweak each single adjustment.